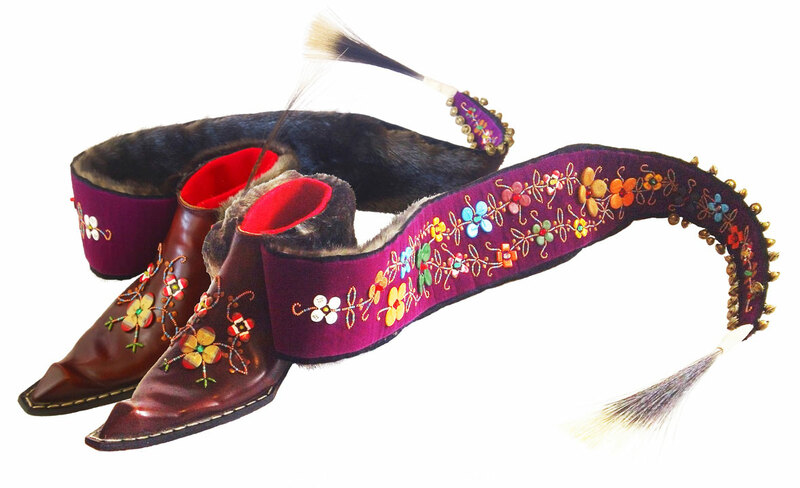 Fox Tail Moccasins (2016) 17.78 x 22.86 x 104.14 cm, mixed media. 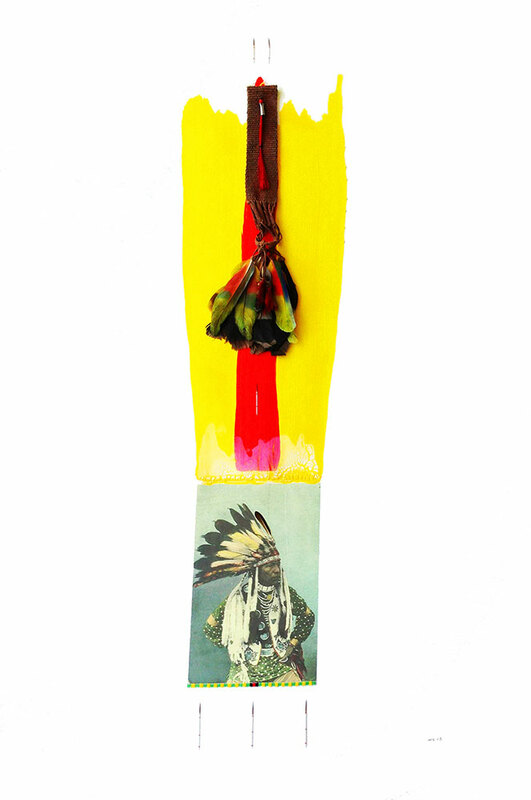 Crow Flies High (2016) 56cm x 76cm, mixed media. 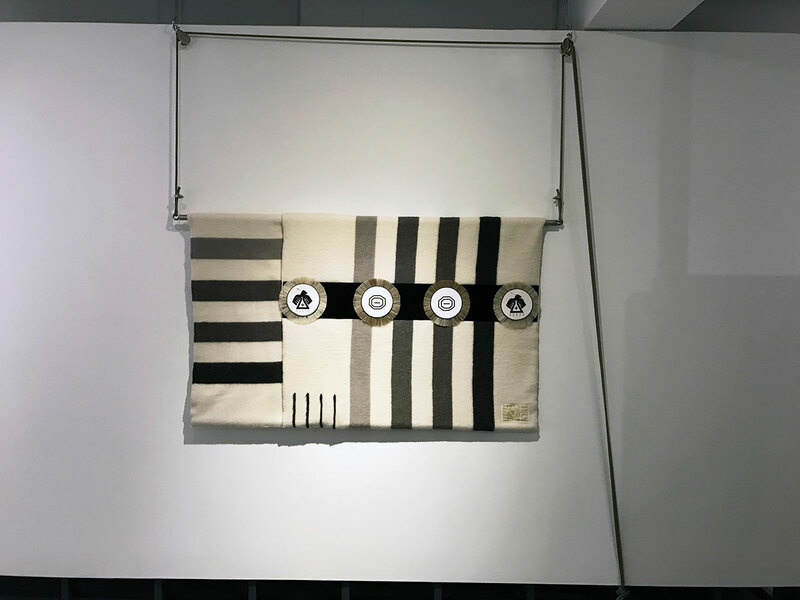 Bandolier for M'Chigeeng (2016) 210(h) x 40(w) x 11(d) cm, mixed media. 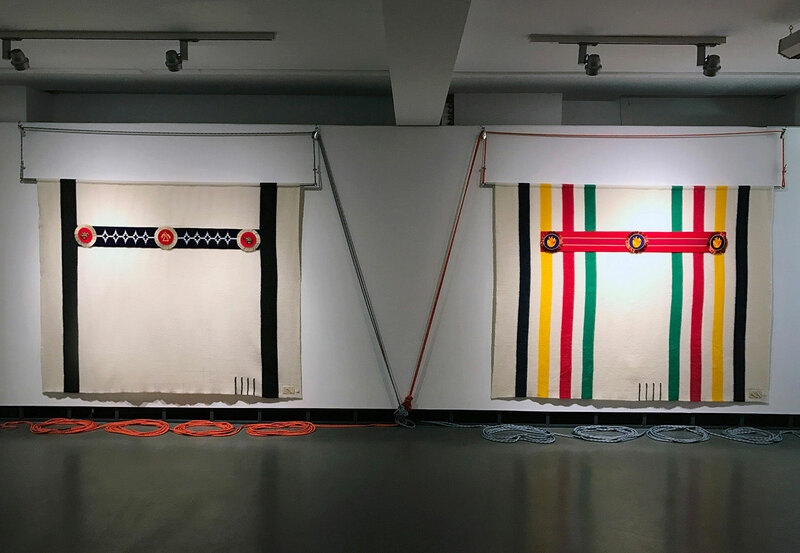 (left) Gichi-zaaga’igan: Lake Ontario (Big Lake) (2016) and (right) Ininwewi-gichigami: Lake Michigan (Illinois Sea) (2016) each measuring 183 x 228 cm, Hudson Bay blanket, velvet, beads, transistors, horse hair, metal, mountain climbing rope. 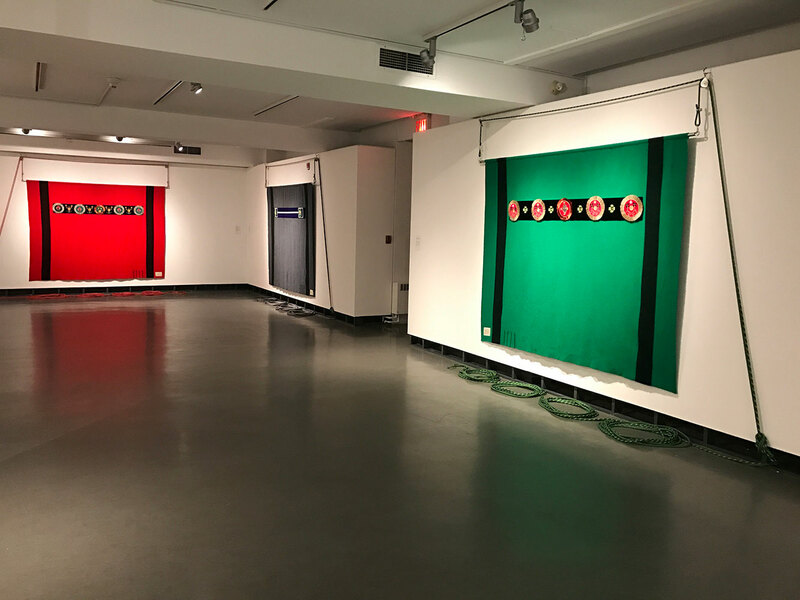 (left) Gichi-aazhoogami-gichigami: Lake Huron (Great Crosswaters Sea) (2016), (centre) Aanikegamaa-gichigami: Lake Erie (Chain of Lakes Sea) (2016) and (right) Anishinaabewi-gichigami: Lake Superior (Anishinaabeg Sea) (2016) each measuring 183 x 228 cm, Hudson Bay blanket, velvet, beads, capacitors, resistors, light emitting diodes, horse hair, copper wire, metal, mountain climbing rope. 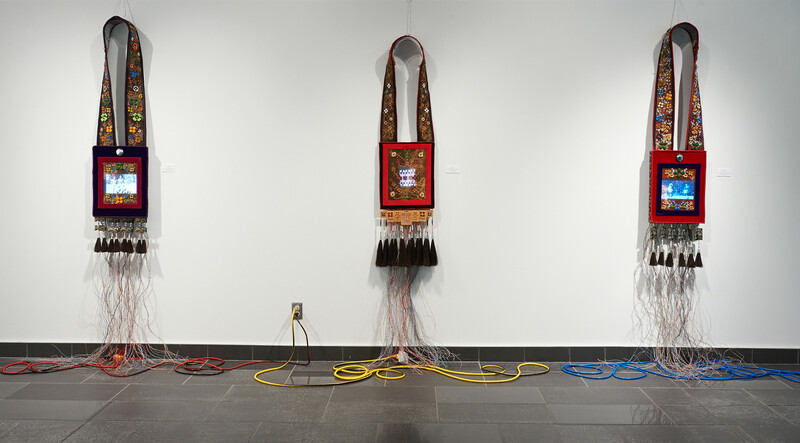 (Detail) Gichi-aazhoogami-gichigami: Lake Huron (Great Crosswaters Sea) (2016) 183 x 228 cm, Hudson Bay blanket, velvet, beads, capacitors, resistors, light emitting diodes, horse hair, copper wire, metal, mountain climbing rope. 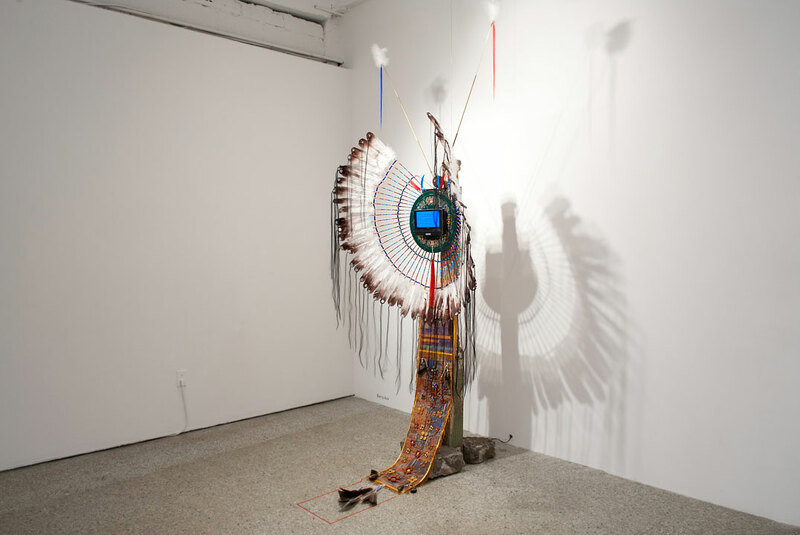 (Detail) Anishinaabewi-gichigami: Lake Superior (Anishinaabeg Sea) (2016) 183 x 228 cm, Hudson Bay blanket, velvet, beads, capacitors, resistors, light emitting diodes, micro chips, horse hair, silver dollars, pewter, copper wire, metal, mountain climbing rope. 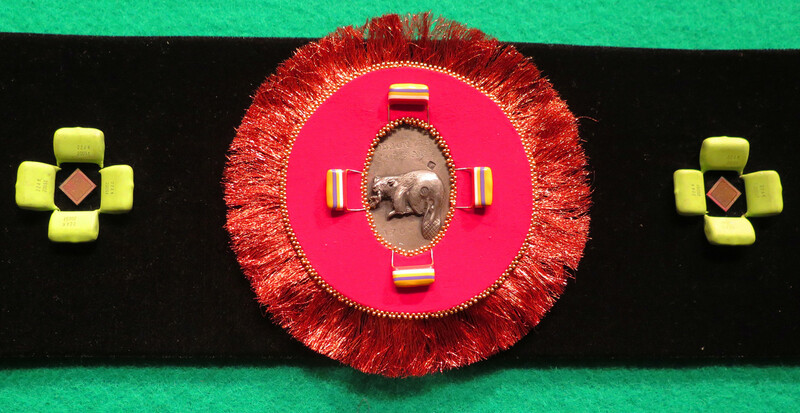 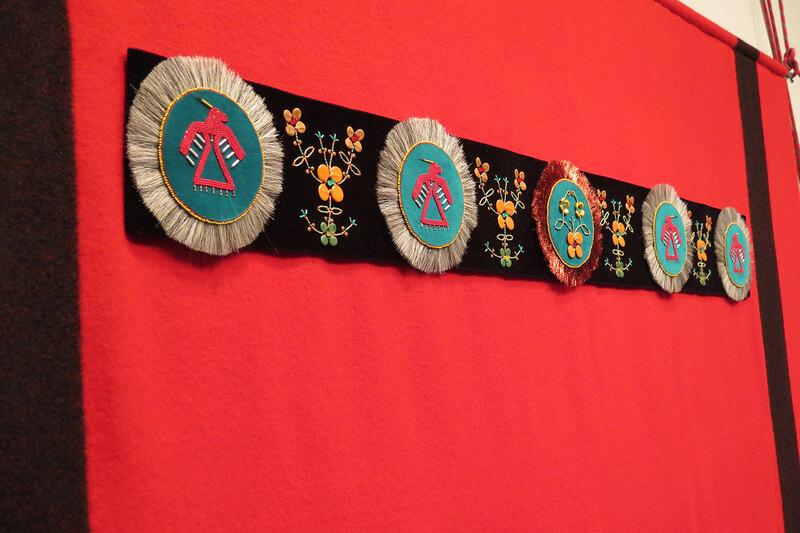 Honouring Blanket for Nahgunegahbow (2016) 163 x 91 cm, wool, velvet, beads, porcupine quills, horse hair. 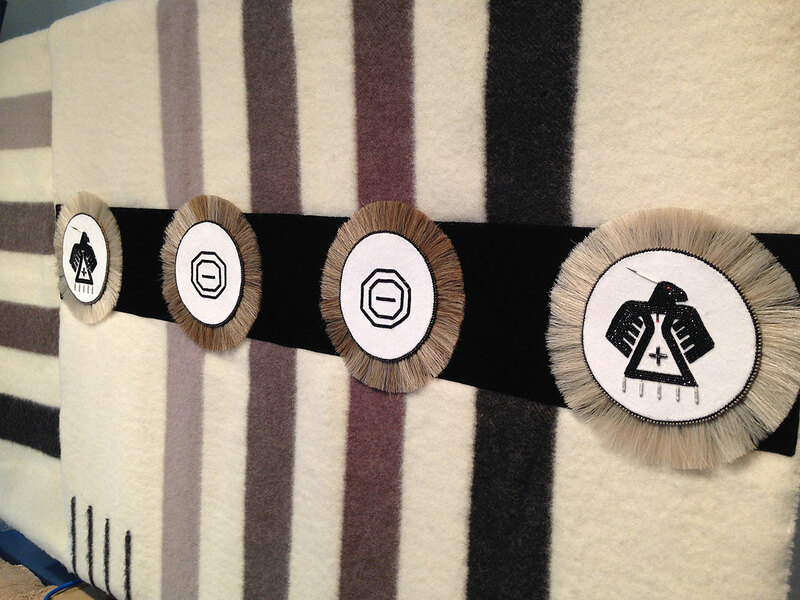 (Detail) Honouring Blanket for Nahgunegahbow (2016) 163 x 91 cm, wool, velvet, beads, porcupine quills, horse hair. 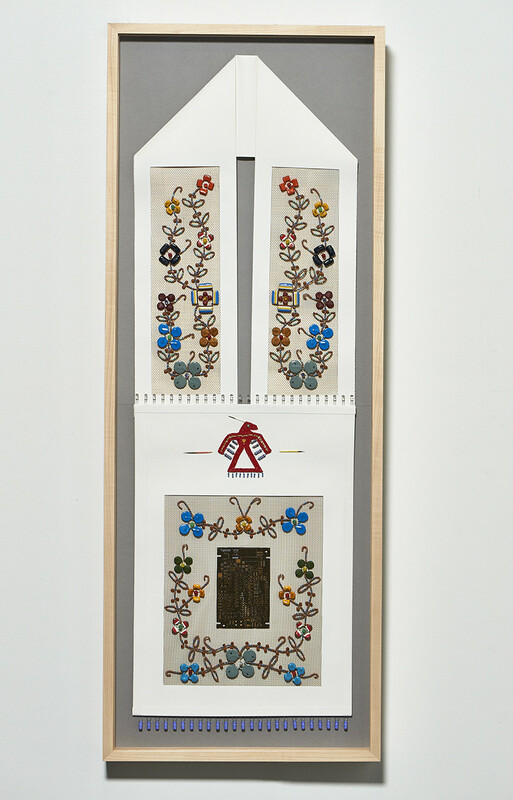 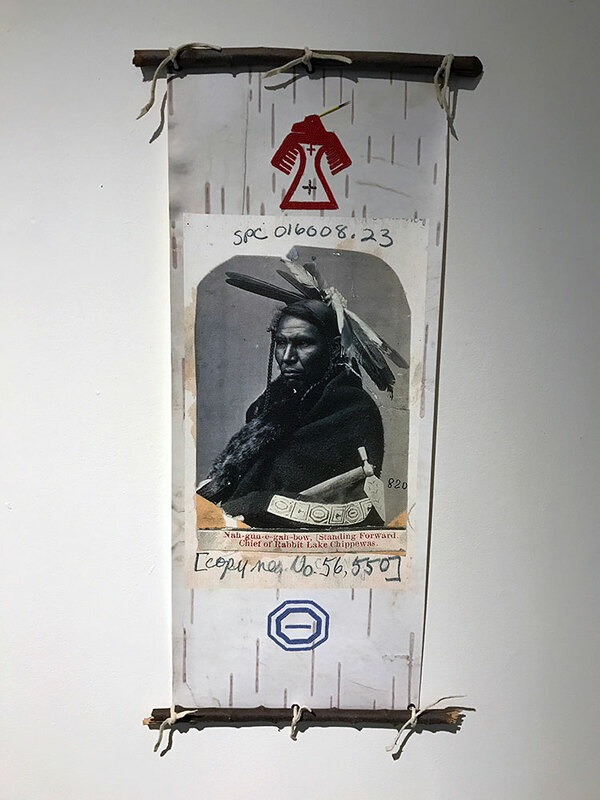 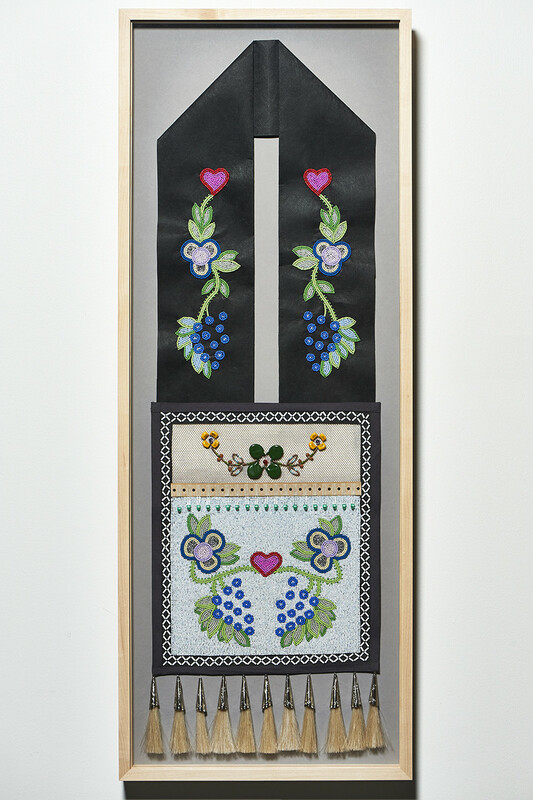 Honouring Scroll for Nahgunegahbow (2016) 33 x 81 cm, digital print on Epson archival canvas, beads, wood, hide. 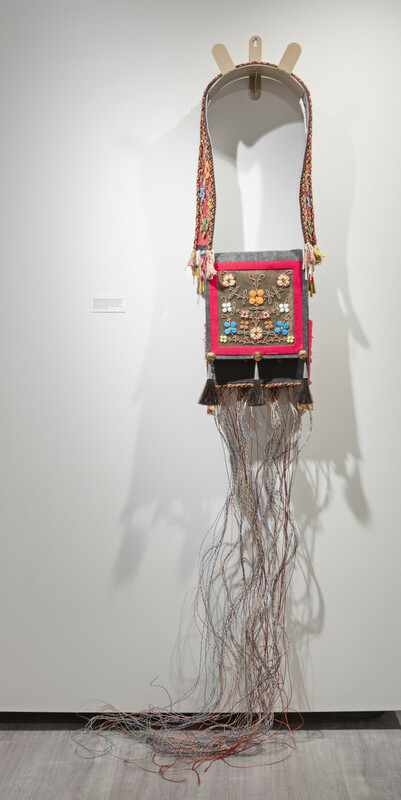 Bandolier for Niibwa Ndanwendaagan (My Relatives) (2015); Digital Bandolier (2011); and Bandolier for Manidoo-minising (Manitoulin Island) (2015); various sizes and mixed media. 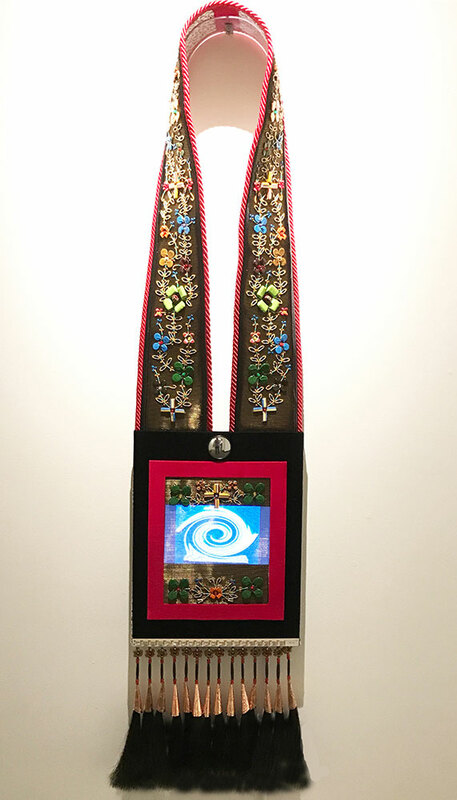 Aazhooningwa'igan “It is worn across the shoulder” (2015) 210(h) x 40(w) x 11(d) cm, mixed media. 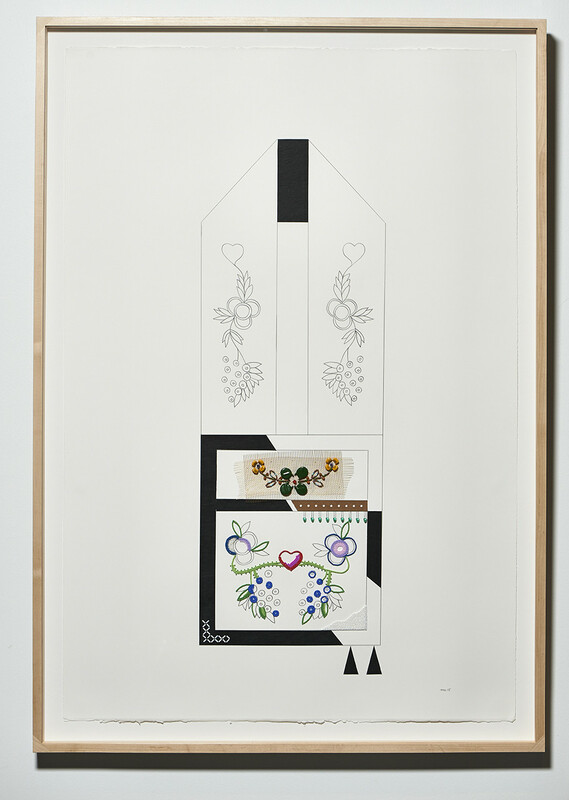 Transformation Bandolier (2015) 100 x 32 cm, mixed media on Arches Platine paper. 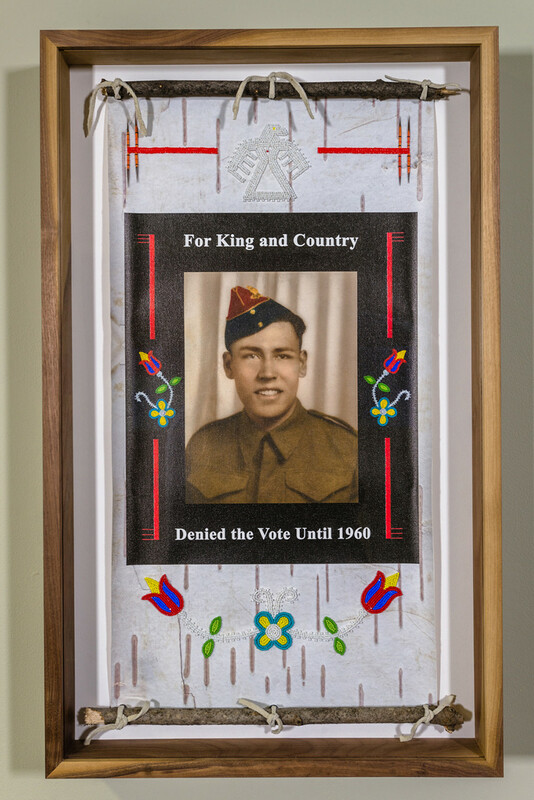 For King and Country (2015) 70 x 43 cm, mixed media on Epson archival canvas. 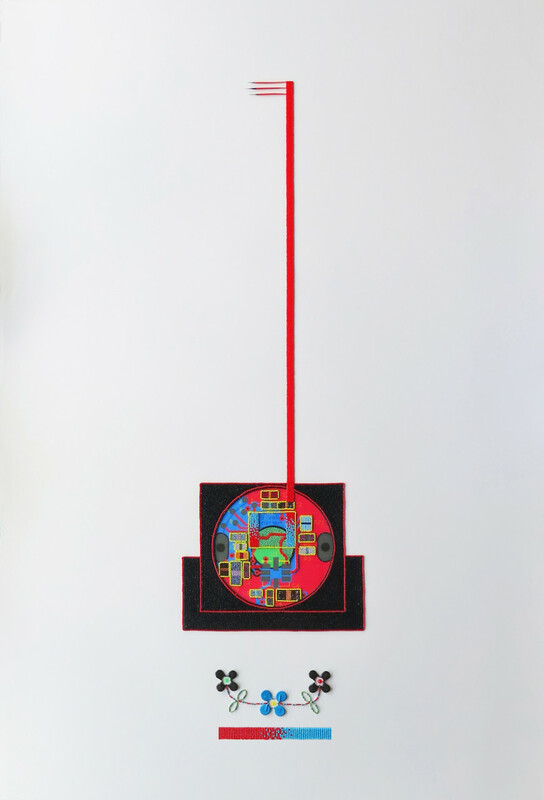 Interface (2015) 76 x 114 cm, mixed media on Arches Platine paper. 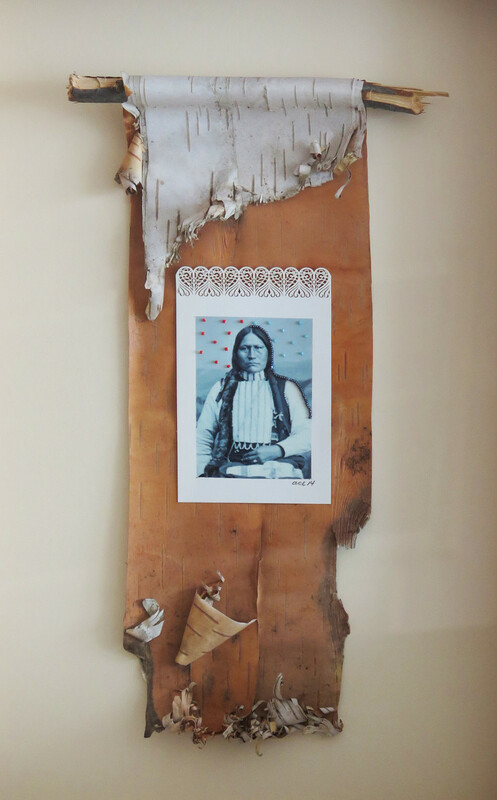 Indigitized (2015) 56 x 76 cm, mixed media. 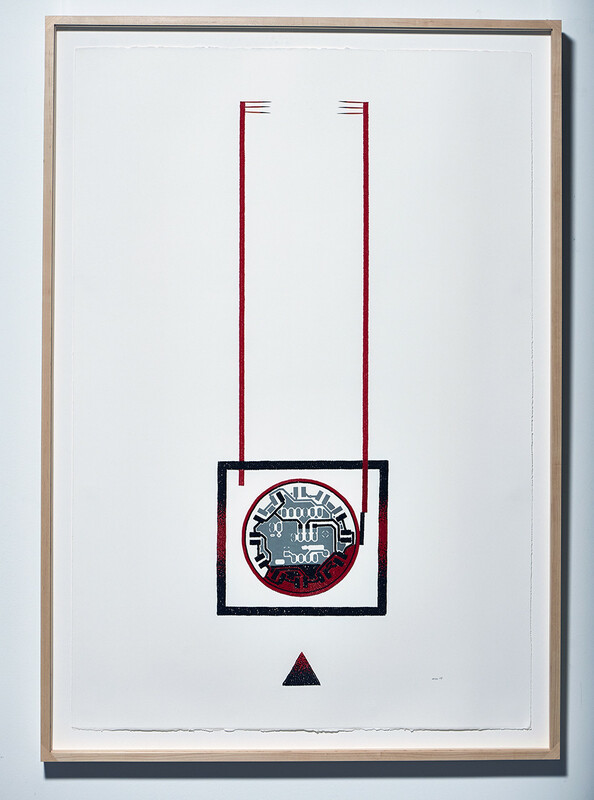 Honour Scroll (2014) 33 x 50 cm, mixed media. 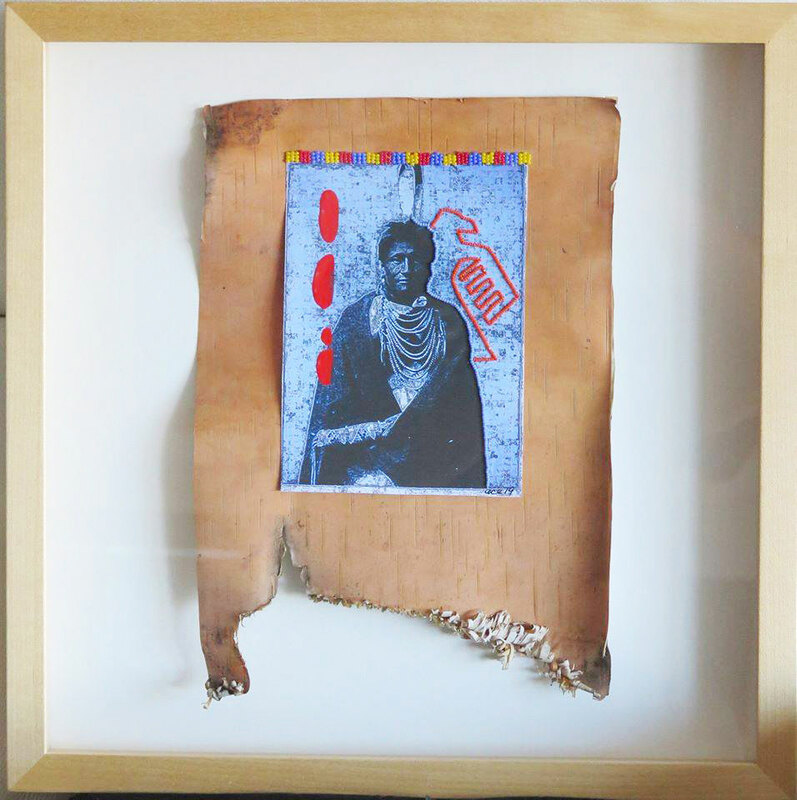 Spirit Guide (2014) 38 x 38 cm, mixed media. 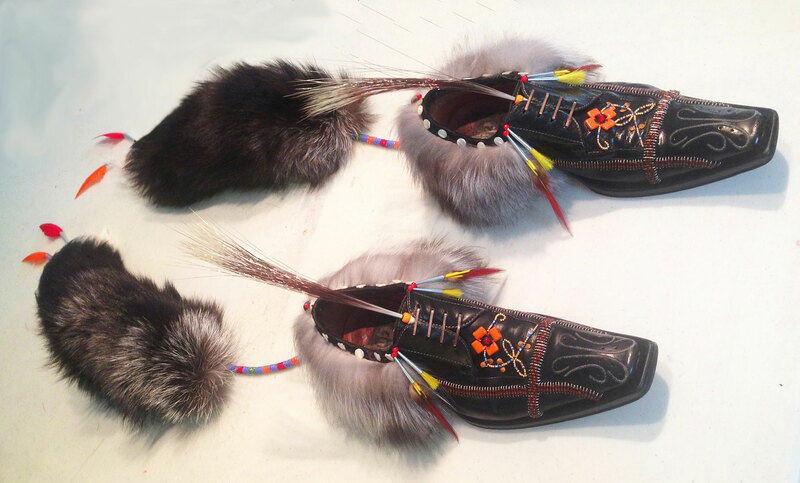 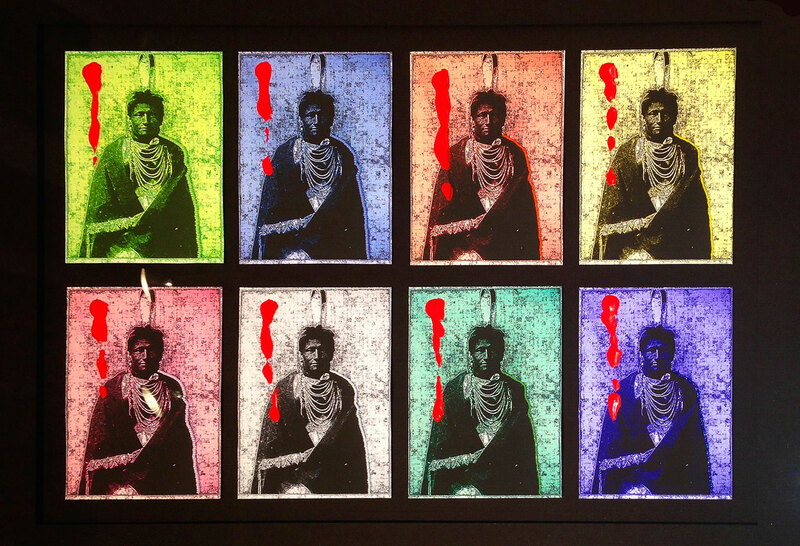 Nigik Makizinan - Otter Moccasins (2014) Each 134.6 x 15.24 x 15.24 cm, mixed media. 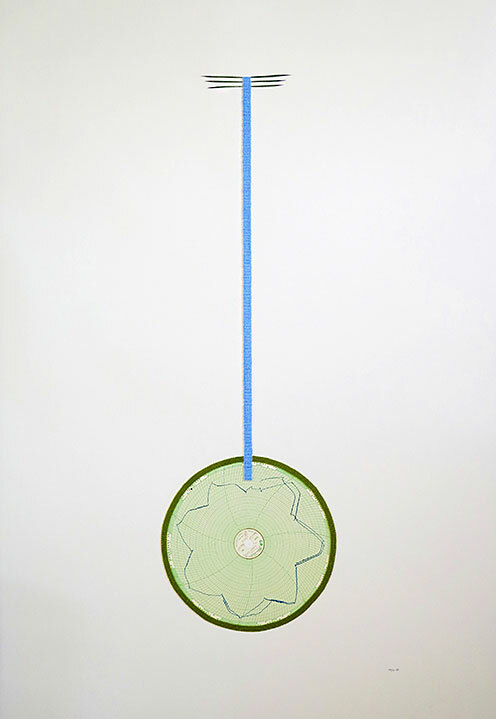 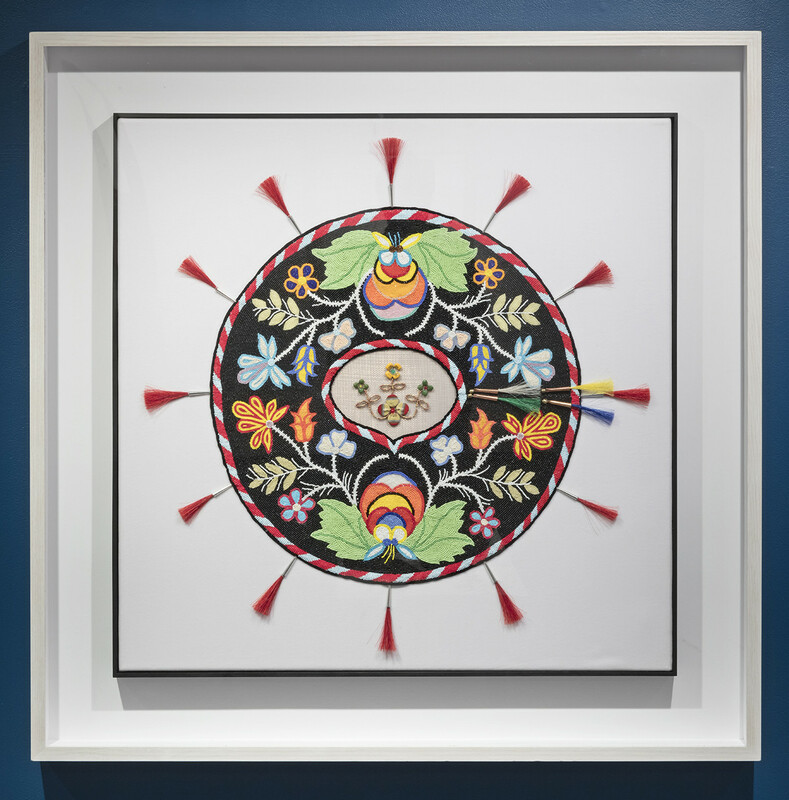 Untitled (2014) 18 x 24 inches, digital print, acrylic, beads. 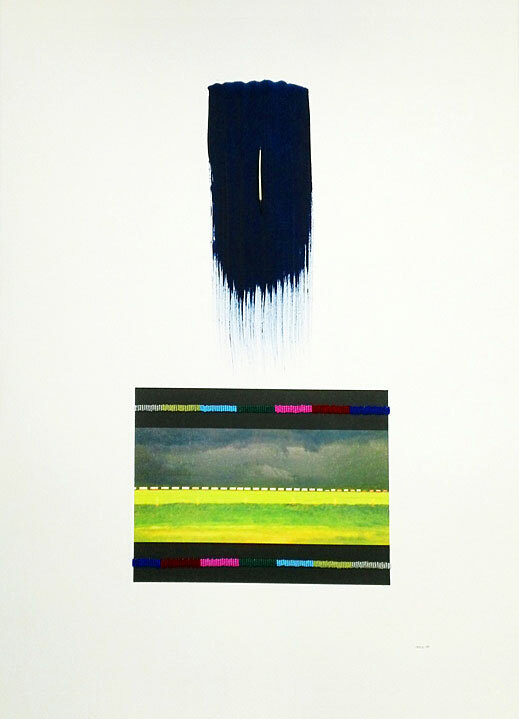 Yellow Sky (2014) 105 x 76 cm, mixed media on paper. 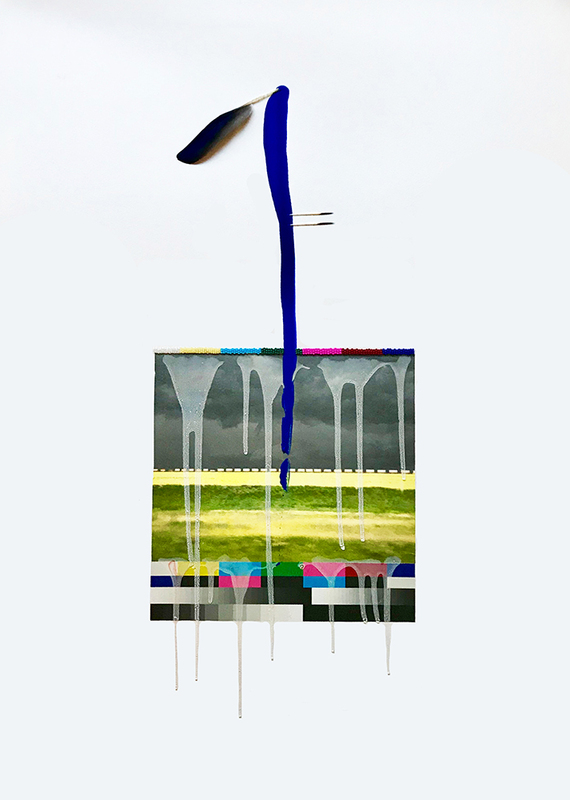 Manidoominens Landscape (2014) 56cm x 76cm, mixed media. 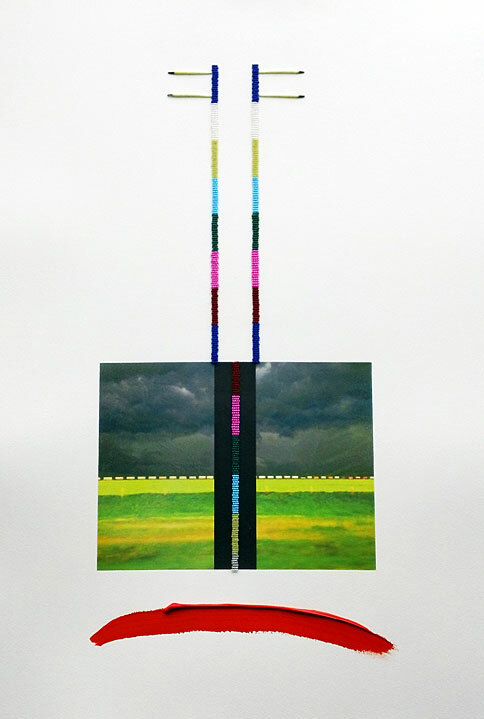 Fork in the Road (2014) 56cm x 76cm, mixed media. 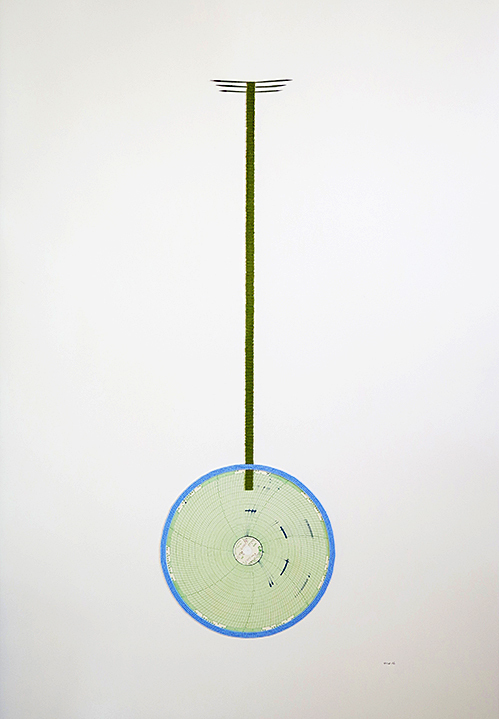 Parallel Roads (2014) 56cm x 76cm, mixed media. 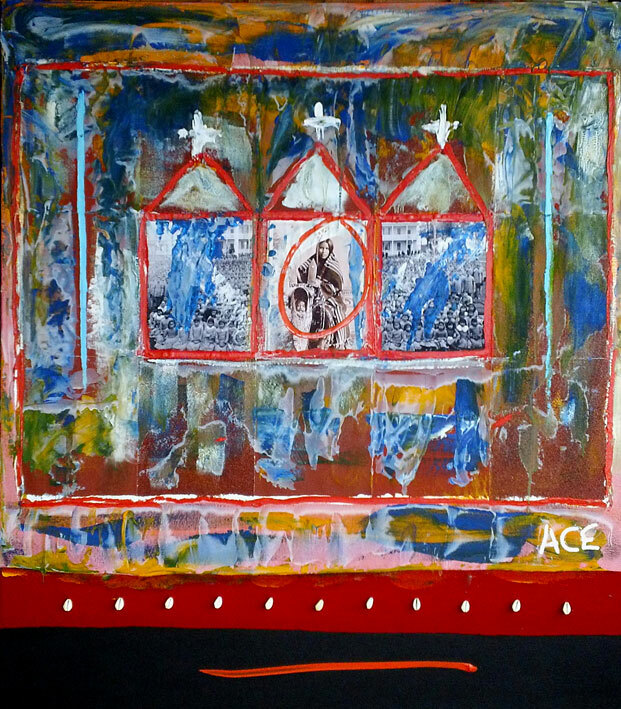 Abstracted Motif (2014) 56cm x 76cm, mixed media. 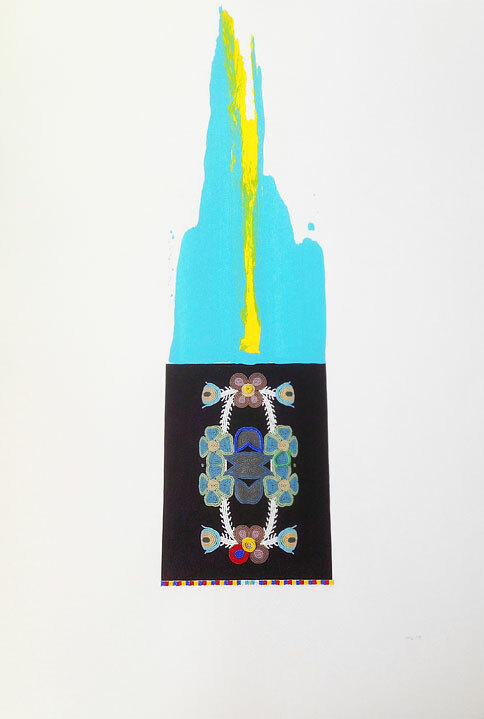 Crow Flies High #1 (2013) 56 x 76 cm, mixed media on paper. 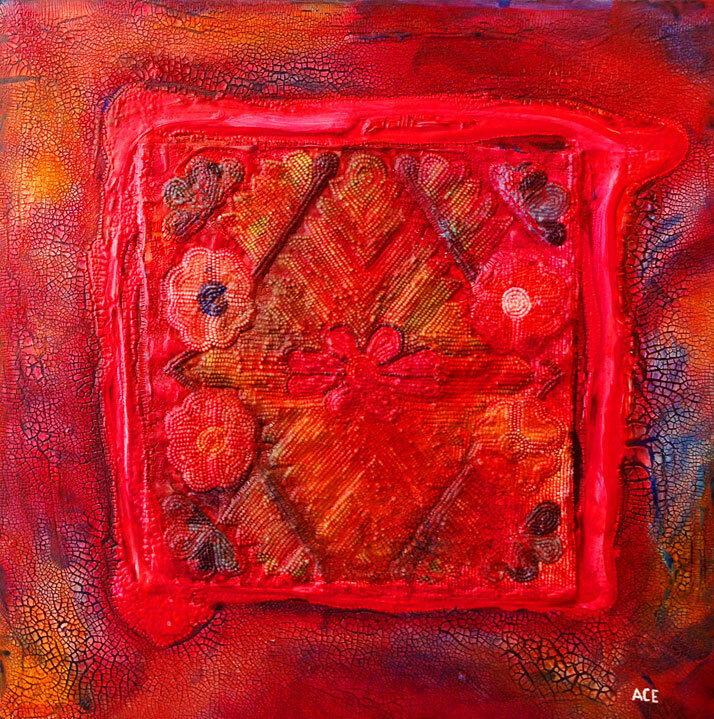 Healing Dance 2 (2013) 100 x 100 cm, mixed media. 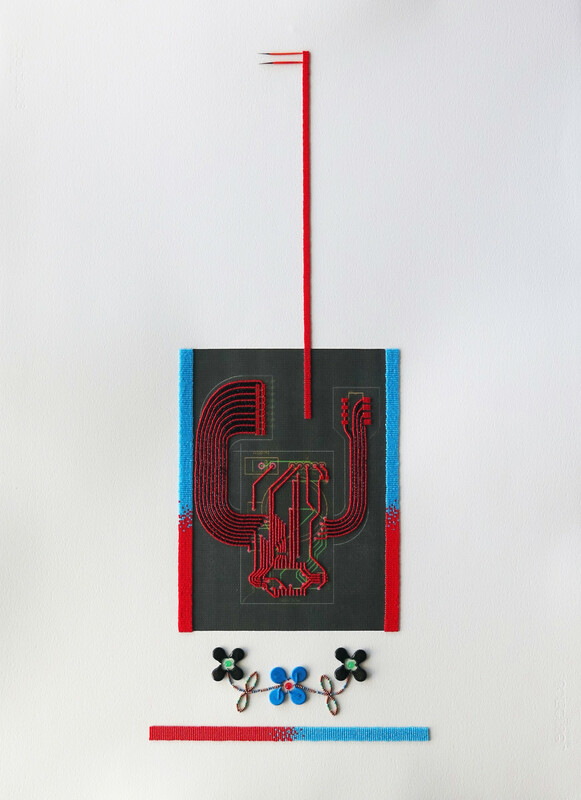 Urban Bustle (2013) 243.84 x 121.92 x 91.44 cm, mixed media. 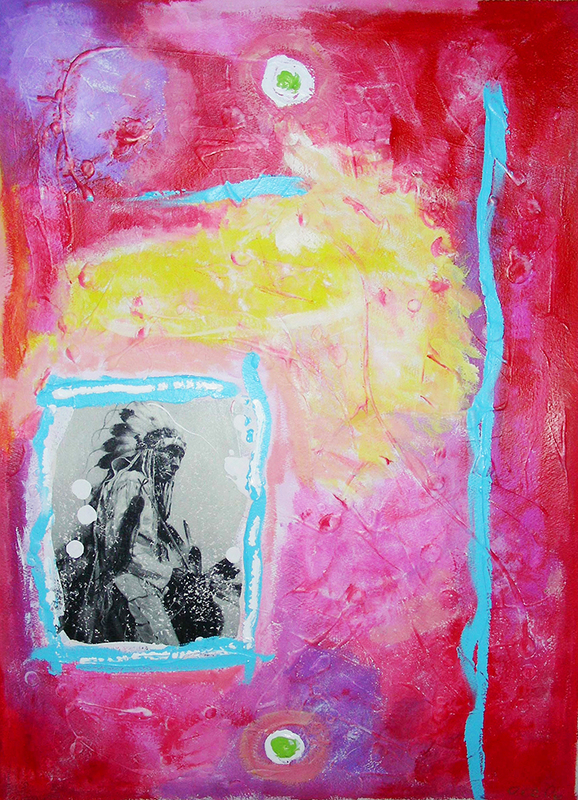 Healing Dance 1 (2013) 92cm x 92cm, mixed media. 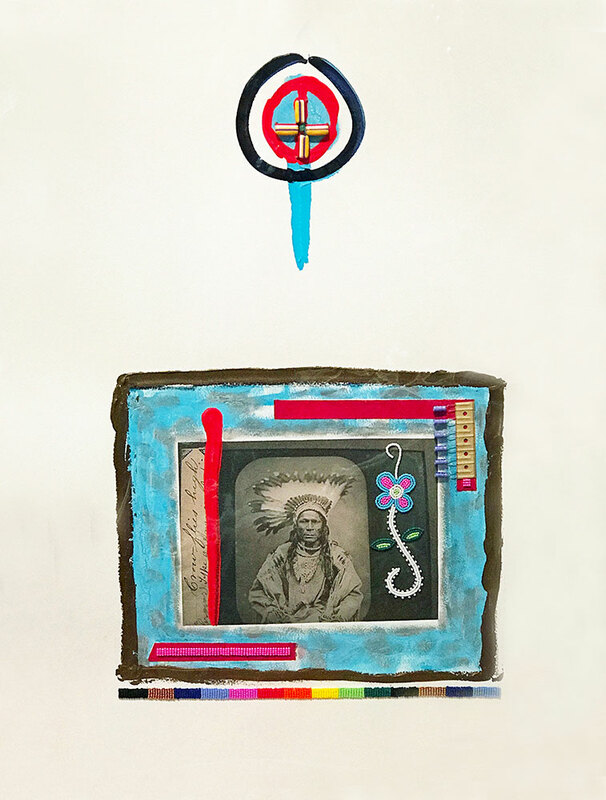 Sitting Bull and Horse Spirit (2013) 56cm x 76cm, acrylic on Arches paper. 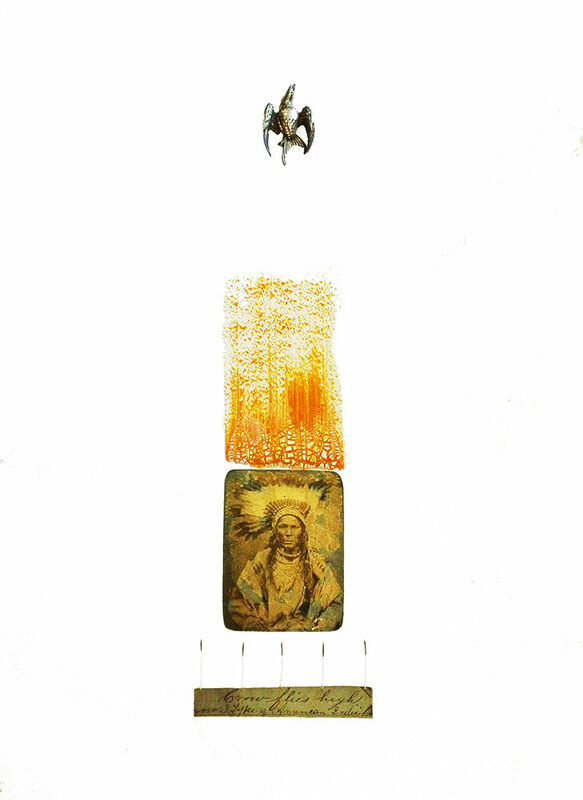 Manidoominens - Spirit Seeds (2013) 25cm x 25cm, mixed media.